Marriage Refresh: A love story in motion. Hardly anyone ever gets married and thinks that their marriage is a sham of a thing. Hardly anyone ever gets married and plans for the divorce. Almost every couple when they get married have some sort of fairy tale to tell about their love story. In fact, when a couple gets engaged people love to hear the story about their engagement. At an anniversary celebration, people love to hear the story about how the couple met. There is always a story, even if it lacks the fireworks. There is always a story of a love that was sparked and led to marriage. But as we know all too well, too many couples don’t make it; just one would be too many, but there are far more than that. The love story that led to an altar fades away into a story of disenchantment, discouragement, disagreement and eventually even divorce. The love story fades away and is put on the shelf if it isn’t thrown into the fire to be utterly destroyed. In an effort to put this love story back together again, to rekindle the love, and to stave off divorce, I want to show you something in the Bible. I want to show you something about marriage in the Bible. And I want to give you an encouragement. It’s an astounding thing when you see what God does with marriage. First, at the very outset of his story he gives us marriage. Right there in the second chapter of this great Book he has left for us of his story, he creates marriage and teaches us about it. Just imagine this. God had created Adam. Perfect. Complete. In God’s image. His will was totally lined up with God’s. But as God surveyed creation that sixth day, he noticed something and even commented on it: “It’s not good for the man to be alone” (cf. Genesis 2:18). There was Adam among all the animals. Each and every animal had their partner and counterpart. But not Adam. It wasn’t good for the man to be alone. So, God got to work. He did some out-patient surgery on Adam and removed a rib. He took that rib and formed a woman from that rib. And she too was perfect, complete, in God’s image. She was just what Adam was missing. And now, now imagine this: “[God] brought her to the man” (Genesis 2:22). Just like a father who walks his daughter down the aisle, God escorted this woman whom he had made down the aisle and presented her to the Adam. Adam could hardly contain himself: “This one, at last, bone of my bone and flesh of my flesh” (Genesis 2:23). He was fired up because she was his and he was hers. These two individuals were now one flesh until the day that they died (except, at this point in history they weren’t supposed to die yet). This is marriage. It is God’s gift to us. He doesn’t want us to go through life alone so he gave us someone to do life along with us. He gave us someone with whom we might enjoy some intensely intimate moments. He gave us someone with whom we might bear and raise children. He gave us, as the book suggests, a friend, a partner, and a lover. This is marriage. ‘Til death do us part. God’s gift to us. From this perfect picture of marriage in the Bible, we see the form and function of marriage fall apart. We see Adam and Eve falling out of their God-given roles. We see the men of the Bible, even some heroes of faith, taking multiple wives and acting like husbands to women who were not their wives. We see marriage perverted, but that’s just a symptom of the problem. The problem is that sin entered the world and God’s people strayed further and further away from him. We see God’s people committing adultery with other gods. Yes, I chose the word “adultery.” I chose it because that’s the word that God used to use to describe the idolatry of his people. That’s the way God saw idolatry. When his people loved, trusted and worshipped an idol it’s like they were cheating on him. “Adultery” is exactly the word for that. But God, in love for his people, took them back. In fact, he pursued them. He found them. He redeemed them. He cleaned them up and made them his again. Like a husband, God pursued his wayward wife to bring her home again. God describes his relationship to us, his people, as if it were a marriage relationship. You can read this marriage drama in Ezekiel 16 or Hosea chapters 1-3. It’s astounding. God uses marriages, real marriages, as a picture of his relationship with us – in its beauty and in its brokenness. He pursues his bride, redeems her from her sinfulness and corruption, and dresses her in beauty once again. He makes her (us!) his and makes this marriage promise: I will betroth you to me forever; I will betroth you in righteousness and justice, in love and compassion. I will betroth you in faithfulness, and you will acknowledge the Lord (Hosea 2:19-20). In marriage, God wants to leave us a picture of his love for us. And the picture lives on in our marriages. The apostle Paul pulls the gift and the picture together so that we can see that marriage and this beautiful picture of God’s love belong together. (It’s really the same thing that God does when he teaches us about his fatherly nature and his father’s heart through earthly dads who protect and provide for, raise and rear their children.) See, when you first get into Ephesians chapter 5 Paul gives us some simple, clear and careful instructions for husbands and wives (Ephesians 5:22-33). He doesn’t mince words. He gets right to the point to help husbands and wives know what God wanted them to do. First, he speaks to wives and tells them to submit to their husbands just like the church submits to Jesus. Immediately, even while he tells wives what to do and how to order themselves under their husbands he gives them a picture to understand what he means to submit. They are to do it “just as the church submits to Christ.” He wants wives to picture their relationship to Jesus while they operate within their marriage. Then, he speaks to husbands and tell them to love their wives just like Jesus loved the church. Paul just can’t help himself as he teaches husbands to see what sort of love they should show to their wives. He can’t help but go on and gush about what Jesus did for the church and he loved her. Jesus gave his very life for the church to make her holy and blameless as his perfect bride. Even while Paul teaches husbands about love, he can’t help but picture for us the love that Jesus has for each one of us. Finally, Paul reviews for us exactly what marriage is, taking us all the way back to the Garden of Eden when first God gave marriage to us. He reminds us that in marriage the two become one. The husband and his wife, they leave the home of their parents. They join themselves to each other until death do them part. It’s beautiful. Marriage truly is a gift of God. Big Idea: In marriage we have a living, breathing picture of God’s relationship with his people. Paul wants us to see that in our marriages, we have a living, breathing picture of God’s relationship with his people. In our marriages, he wants us to see how God pursues us like a husband pursues his wife. He wants us to see how God chases us down, seeks us out, finds us, and takes us to be his. In our marriages, he wants us to see how God forgives, how he shows boundless love, mercy and grace. That’s why I love the intentional bit of this book we’re reading. In our Marriage Refresh studies, we’re reading a book called “Friends, Partners, Lovers.” The author makes a big point to talk to us about being intentional, purposefully and measured in our marriages. And that’s exactly what God was in his marriage to us, his bride. He was intentional! He had a plan and then he pursued it. He developed that plan and then carried it out on the cross. And even in our lives, God pursued us, wooed us, won us and made us his. Our marriage to our God is one the greatest love stories every told. It tells how God went to all lengths to make us his. It tells us how God is still pursuing us to keep us as his. And in marriage, we get to live out the drama of God and his bride. When you pursue your spouse, you are showing the love of God to win back his wife. When you forgive your spouse, you are doing what God does for us every day. When it breaks your heart when your marriages is fractured and broken, you can begin to grasp how God feels when we break our relationship with him through sin. When your marriage is repaired and reconciled, you can begin to understand how glad and full of joy is when our relationship with his repaired and restored. So, here’s my question: How will you picture the pursuing and intentional love of God in your marriage? When you play the part of the pursuing and the intentional, then you give the world and to your spouse the pursuing and intentional love of God. Next time, we’ll start looking at friendship in the Scriptures and what it means for us to be a friend, yes, the best friend of our spouse. There are certain things that we have to do. We can’t avoid them without some serious consequences. We have to brush our teeth or our teeth will rot away. We have to sleep. We have to work. We have to have income. We have to eat and drink. These days especially we have to heat our homes and wear thick jackets. These are things that we have to do. We have to do them or we will die (or at least the quality of our life will suffer). Jesus had much of the same “have tos.” Remember, he was a human being. It was natural and quite normal for Jesus to get hungry and tired. We see it in John 4. John tells us that Jesus, tired as he was from the journey, sat down near a well and asked a woman for a drink. He was tired and thirsty. Later, his disciples brought him some lunch and asked him if he wanted to eat. He had to eat. He had to drink. He had to rest. But when his disciples asked him if he wanted to eat Jesus answered them in a strange way: Meanwhile his disciples urged him, “Rabbi, eat something.” But he said to them, “I have food to eat that you know nothing about.” Then his disciples said to each other, “Could someone have brought him food?” “My food,” said Jesus, “is to do the will of him who sent me and to finish his work.” (Cf. John 4:31-34). Jesus had work to do! It was his food. It was his sustenance. He had to go to Samaria! John actually uses those words at the beginning of John 4. Jesus and his disciples were on their way from Judea in the south to Galilee in the north. Samaria was in the middle. Normally a Jew, would go around Samaria. He/she wanted to avoid the Samaritans. It was like trying to avoid a certain part of town that is a little bit iffy and questionable. We don’t really want to go through there and maybe not even near there. But Jesus had to. He had to travel through Samaria (cf. John 4:4). When he got there he had to engage in conversation with a Samaritan woman. That too was surprising. The woman was surprised that he, a Jewish man, was talking to her, a Samaritan woman (cf. John 4:9). His disciples came back from the grocery store with some lunch and they were surprised that he had been having a conversation with a Samaritan woman (cf. John 4:27). But he had to! He had to tell her about water and food that would satisfy her soul in a far deeper way than a glass of cool water could ever satisfy. He had to tell her who he was, the eternal “I am,” the Messiah, the Christ, who was coming to save all people and to teach people the truth. Jesus had to! He had to go to Samaria for this woman. He had to go to Samaria for everyone else in that town who would hear about him through this woman’s witness. He had to! It was a divine necessity. Jesus had to keep on going from Samaria. It was a divine necessity. He had to keep going to Galilee so that he could heal the ruler’s son. He had to keep going throughout Galilee, Samaria, Judea and all over that region so that more and more people would hear, know and believe that he had come for them, that he was the Savior of the world (cf. John 4:42). The fields were truly ripe for the harvest (cf. John 4:35). But he had more work to do than just preach and teach. He had to keep going from Galilee back into Judea, back into Jerusalem. He had to! He had die there in Jerusalem for the sins of the Samaritan woman and the sins of the ruler from Capernaum. He had die in Jerusalem for the sins of the world. He had to! It was a divine necessity. He had to and he did. He gave up his life as a sacrifice for my sins and for yours. He shed his blood to forgive your sins and mine. He had to do this and he did. He finished the work that his Father sent him to do. His Have-to Becomes our Get-to. He labored and we benefit from him. Jesus told his disciples that it would be so: “I sent you to reap what you didn’t labor for; others have labored, and you have benefited from their labor” (John 4:38). Jesus labored throughout his life and on the cross. Jesus labored and benefit from it. We reap the forgiveness of sins flowing from the blood of his cross. We reap an eternity with our God because Jesus took the curse of our sins. We reap grace in place of grace from the work that he did. This turns our have-to into a get-to. There is no more “have to” for us. The demands of God have all been met in Christ. The punishment of God has all been paid at the cross. God is no longer standing over us with his arms folded saying, “You have to…”. Instead, our feet run to do what God calls us to do. Our have-to becomes a get-to. No one had to tell this woman to go back to her town and tell her neighbors about Jesus. No one told her to do this, but that’s what she did. She left that well moved by the love of Jesus to tell everyone in the town about Jesus. It was her privilege. It was her joy. Jesus had taken the mess of her life and was now going to use her for ministry. He took her past away, forgiving it all. And now he was going to use her to get the gospel to so many more people. Her whole town was converted because this woman went back to tell them about what Jesus had said to her. This is our privilege and our joy. Jesus does the same in our life. He turns our mess into our ministry. He forgives our sins and then uses us to serve other people. That is now our work: to take the gospel to our homes, our neighborhoods and communities. That is now our work: To comfort people with same comfort we have received from God. To encourage people with same encouragement we have received. To forgive people just as we have been forgiven. This is what we get to do with our lives. And Jesus will use it. He has to. I’m a dad five times over. God, my Father, has blessed me with five children whom I love dearly and they are such a blessing to me. Through them, he has taught me so much about grace. I consider what my children actually deserve from me. I even consider what part they have in their own existence. They didn’t tap Ruth and I on the shoulder and ask to be born. When they were ready to be born, they didn’t tap Ruth on the belly and ask to come out. Again this was something thoroughly outside of their powers and control. They were totally at our mercy. Ruth and I didn’t have much power in this either. We prayed for children and we prayed for a healthy delivery, but at the end of the day we weren’t in control of children actually being conceived or when they would be born. Once they came out of the womb, they were still totally reliant on our kindness and mercy. Still it was grace. They didn’t work for the clothes they wore or for the bed they sleep in. Time magazine published a report in 2017 by the Department of Agriculture that estimated it costs around $233,610 for a middle class family to raise a child through the age of 17. What they do to earn that care!?! They didn’t earn the gifts we give them on their birthday, at Christmas, or other random times. They didn’t deserve it at all, not in the least. I love my children, dearly. But it’s not because they chose to be in my family or deserved the kindnesses that I love to show them. We are children of God simply and only by the power of God the Spirit. That’s the grace that Jesus makes clear to Nicodemus (and us!) here in chapter 3. We were born once of parents (of flesh) who gave us birth. That flesh will only give birth to flesh and death. That’s why it is absolutely that the Holy Spirit must give birth to us through water and the word. The Spirit gives birth to children of God and thus also to life. It’s all grace! Marvel, dear child of God, that you are not a child of flesh, but a child of God. Marvel, dear child of God, that the Spirit, who blows here and there like a wind, has blown with his power into your heart and has claimed you for God. You are chosen by God! You are loved by God! You are dear to him. You are his dear child! With our birth into God’s family, God gives us more grace! We can understand these things of God. By his grace, we can read John 3 and understand what Jesus is talking about. Sure, there are things we want to understand better. Sure, there are things we still have questions about. But we get it! We understand what Jesus is talking about. We understand that this is a section teaching us about baptism. Water and the Holy Spirit give birth to children of God. We understand that. We understand that Jesus wants us to know how great God’s love is. And more than understanding, we have faith! We believe this and so have eternal life. What grace is this!?! That we believe and by faith we already have life assured to us. Spiritual Attitudes: Still more Grace! I want to be a child of God like John the Baptist. He started his ministry and things seemed to be going pretty well. The crowds came out to him in the wilderness from all over. He seems to have had a healthy crowd of disciples around him whom he was discipling and teaching. But then Jesus came and that all changed. His disciples packed up their things and started following Jesus. Then, the crowds who used to flock to him now began to flock to Jesus. His ministry was blowing up in his face and John says, “Awesome!” Such grace was given to John that his greatest joy was that Jesus would be glorified. John’s greatest joy was that people would follow Jesus and be saved. “He must be greater; I must become less” (John 3:30). That was grace to him! I want to have an attitude like that. I want to have a heart like that. But deep down in following after Jesus, I’m chasing greatness. You too? We want people to notice us. We want people to appreciate us. We want people to pat us on the back. We want to become greater in the eyes of the world. And it’s not just that. We want to be greater in the eyes of God. We want God to look at us as his followers and say, “Wow! I sure am glad that they’re on my team!” We want God’s approval and applause. God in grace, says, “You are truly great!” You already have God’s approval and applause. His Son Jesus won it for you. When God sees you, he sees his Son’s glory and righteousness. And then, with more grace still, God pours out more grace by his Spirit, to change our attitudes about greatness making us humble like his Son. God pours out more grace to transform us into the likeness of his Son. From beginning to end, from our spiritual birth to our spiritual attitudes, God pours out grace in place of grace already given (cf. John 1:16). What grace our Father has lavished on us! In the opening chapter of John, we are introduced to some powerful images and themes that will show themselves again and again. Light and Dark. Life and death. Grace and Truth. In John 1:17 he says, “The Law was given through Moses; grace and truth came through Jesus Christ.” It isn’t blatant. It isn’t explicit. But it becomes very obvious that Jesus came in grace and truth as one walks their way through John 2. Grace is precisely what we see at the wedding at Cana. Now, with some disciples in tow, Jesus makes his way to a wedding to which they had all been invited. Wedding were often an extravagant affair as they often are in our day as well. These weddings lasted more than an afternoon and evenings. These weddings lasted much longer. At this particular wedding, they ran out of wine and Jesus with divine, miraculous intervention turned six jars of water into six jars of wine, approximately 120-180 gallons! And this wasn’t the cheap wine either. This was fine wine, better than had been served at this wedding previously. The miracle itself is all grace. There is no reason that Jesus should have intervened. No one was going to live or die if Jesus didn’t intervene in this case. The wedding might have been ruined, but everyone would have survived. Yet, here comes Jesus to bring joy and gladness to a festive occasion. In pure grace and mercy, Jesus performed this miracle that made people happy. In grace he simply made people happy. The evidence of his power is all grace. John concludes his recollection of this event with the statement: “He revealed his glory; and his disciples believed in him” (John 2:11). There is grace here too. Jesus wanted his disciples to trust him more and more. So, in love for them, he intervened so that they (and we!) would know his divine power to intervene in these and many other ways. John shows us that Jesus came in grace. And truth. It’s interesting to me how John groups things together in his book. In the gospel of Mark there are often statements that directly connect one event to another. In the gospel of Luke, Luke leaves behind breadcrumbs of historical information so that we can more or less identify what happens when. But here there don’t seem to the same clues. John leaves us here. Jesus and his disciples hung out in Capernaum (v 12). Then, at some point in the future, Jesus and his disciples went up to Jerusalem for the Passover (v 13). There Jesus came in truth. Things were a mess in the temple. People were selling stuff. People were exchanging stuff. Except that wasn’t the full problem. There was some need for animals to be sold and for money to be exchanged. The problem was that people forgot why they were there. They forgot what the temple was for and what was to happen in the temple. The temple was a place for prayer. The temple was a place for worship. The temple was a place for people to close to God. It was not a place to make money. In truth, Jesus came with force and with zeal to clean out the temple. He turned over the tables and scattered the coins. He drove people out of the temple courts with whips. He came in truth to clear out the temple and to clear a space for people to worship God, to come to him in spirit and in truth. In truth, Jesus came to call the people to repentance. At the end of the day, this moment in the temple wasn’t about cleaning up a place, it was about cleaning up a people. Jesus would long for the people of Jerusalem to repent of their sins and to come to him for peace and forgiveness. He longed for that with all his heart. But instead the people came at him with challenging questions, daring him to prove his authority to do this in the temple. All the while Jesus wanted to draw them close. What you see in all of this is that Jesus is on a mission. He is on a mission to restore all things, to turn back the curse, to bring joy where there is weeping, to bring life where there is death. If we go through this all too quickly we miss that grace in the miracle at Cana. The bare miracle was Jesus turning water to wine. We see Jesus’ power. But more than power, we see Jesus on a mission to turn back the curse. We see Jesus ushering in heaven, but not on earth. That will never be. We will never have heaven on earth, but in all eternity when we are with our God and the curse will not just be turned back, the curse will be destroyed. And there will be wine! Isaiah says it like this: On this mountain the Lord Almighty will prepare a feast of rich food for all peoples, a banquet of aged wine— the best of meats and the finest of wines. On this mountain he will destroy the shroud that enfolds all peoples, the sheet that covers all nations; he will swallow up death forever. The Sovereign Lord will wipe away the tears from all faces; he will remove his people’s disgrace from all the earth. The Lord has spoken (Isaiah 25:6-8). Jesus is on a mission to fit heaven for us and to fit us for heaven. That’s why he bursts out in Jerusalem with such zeal. It’s not just about the place. This was a fit of zeal for a person – first, for his Father’s glory and honor. Then, it was a fit of zeal for the people there and ultimately for all people. Jesus is absolutely zealous and on fire for you. His heart burns to save you and will burst in where he needs. His heart burns to dole out grace in lavish measure. This is your Savior, full of grace and truth! The gospel of John is such an incredible book of the Bible. It is unique and distinctive in some powerful ways. Some of them are purely interesting. For example, John is the latest gospel to be written. In style, the gospel of John is also very simple, yet profound. Other things that you might notice about the gospel of John impact us as John gives us so much Jesus in every word that his pen puts to paper. Only reading through the first chapter of John, you might notice what John is doing in this gospel. John wants us to think. His words are simple. His sentences are short. But they are profound. John seems to be writing for a largely Christian audience who knows the basics about the life and history of Jesus. Yet, he wants them to know more. He wants them to think. So, he writes in such a way so that his readers are forced to read and reread these statements of John. They are almost proverbial in nature. There are sentences that make us pause to think – what exactly does John mean!?! We want to seek out the depths of John’s simple words. Throughout his gospel, John wants to make it very clear that Jesus is divine, that he is clearly and truly God. This is an essential truth not only to John’s gospel, but also to the Gospel of Jesus. We must see, know and believe that he is God or else we have no salvation. John was writing at a time when the deity of Jesus was in question. He wanted to make it repeatedly clear that Jesus, the Son of Man, truly was the Son of God. Throughout this gospel you will see the divinity of Jesus on full display. There are many other things to notice, but let me share this one more. John is not in a hurry to move from one incident or occasion to the next. He wants to slow down on a couple of unique moments in Jesus’ life, especially when Jesus is the one teaching the crowds, his disciples, and even his enemies about who he is. This is the most clear in the family “I am” statements of Jesus. In this extended discourses, Jesus makes clear and definitive statements about who he is. This is John’s purpose. He wants us to know Jesus. And he helps us know Jesus by setting up some powerful themes in the opening chapter. These themes will show up throughout this Gospel of his. In chapter one, he introduces the themes of light and dark. Consider, for instance, “The light shines in the darkness, and the darkness has not overcome it” (John 1:5). Read through the gospel of John and you’ll quickly notice how LIGHT shows up again and again. He is bringing light to this world. He will expose sin for what it is. He will expose and he will obliterate it. He will bring sight to the blind and light to those living in darkness so that we can see him as he really is. Closely connected to the theme of light is the theme of life and death. Where there is light there is also life. Put plants into a dark room, and they will shrivel up and die. Take light away from human beings and we lack some vital nutrients that we need for a happy and healthy life. Where there is light there is also life. You see, Jesus came to bring life, eternal life (cf. John 3:16), even life to the full (cf. John 10:10), to all people who believe in him. Jesus came to bring light where there was darkness and life where there was death. But that doesn’t mean that there was no opposition. Quite to the contrary, the darkness fought back against the light and death tried with all its might to overcome life. But Jesus would not be overcome by any of his adversaries. In fact, with clear teaching and light from God’s Word Jesus exposed them for who they were. He took them on even as he tried to pierce the darkness of their hearts with his light. Most of all, Jesus wants to make himself known to us and to the world. He is the revelation of God to the world. Yes, if you want to know who God is and what God is like, then you really need to get to know Jesus. Then you really need to get to know Jesus. “No one has ever seen God, but the one and only Son, who is himself God and is in closest relationship with the Father, has made him known” (‭‭John‬ ‭1:18‬). He makes God known as the God of grace and truth. He longs to pour out grace and mercy on his children. He has given us an adoption into his family, purely out of grace and mercy. When Jesus came into this world, he came not to condemn the world but to save the world through him. And at the very same time, he speaks the truth. He doesn’t sugarcoat anything. He speaks the truth about sin. He speaks the truth about God’s Word. He speaks the truth about sin. He calls it like it is. He is the God of grace and mercy, who loves his people and wants to win them for himself. All of these things and more you find in John chapter 1. It is a rich chapter full of the greatness of our God who loves us more than the life of his Son, full of the greatness of our Savior who is fully God in the flesh. It is a rich chapter full of the grace of our Savior who came on a mission to take our sins on himself as though they were his very own. But it is rich for us in this way also, that our God invites people, even sinners, like John and Andrew, Peter and Philip, even Nathanael, to join him on this mission. It is rich for us is in this, that our God has given us the right to be called children of God. It isn’t that we made this decision to follow him. It isn’t that we were born into this. It was that God gave us birth into his family. We’re his children. And as highly as John teaches us to view Jesus in this chapter, just so highly does our God view us! Jesus looked at Nathanael and, by faith, called him one without guile or deceit. Even so, Jesus looks at us and, by faith, calls us ones without guile or deceit. He exalts us to sonship and invites us to join him in his mission of saving people. Yes, this gospel of John and even the first chapter alone is incredible. It is incredible because of the way that it is written. But it is more incredible because of the message that it proclaims and the light that it brings. I don’t know about you but whenever I hear the word “meditate” I think of yoga class. I’ve never actually had the pleasure of attending one, but that’s what comes to mind. I imagine sitting quietly and trying to empty my mind of all that fills it, the things that stress me, the things that scare me, the things that overwhelm me. When God teaches me to meditate he imagines for me a lion who has a low rumble gurgling up from it’s mouth. It’s a lion who has caught his prey, has taken a portion of that prey for dinner, and now retreats to a quiet place to enjoy his meal. A low growl rumbles from his throat because he is enjoying his meal.Similarly, God imagines a dog who got his bone and now retreats to a corner to gnaw on it for a while. The dog growls and drools because it’s enjoying the treat. God’s Word is a treat for our souls. It’s a food that delights us like honey in our mouth. It’s like the finest wines and the choicest foods. Meditation takes that word off to a quiet place so that we can taste every nuance of the food, chew on it and take it to heart. TIME– You can’t do it in a moment. It doesn’t happen quickly. It’s something that we need to do for more than just a moment as if we were staring at a text message or scrolling through Facebook. It takes time to think about, chew on and enjoy a verse from God’s Word. It takes time to squeeze every drop of Jesus out of a text, to get all the goodness out of that verse. QUIET– It also takes quiet. You need quiet space in your mind to be able to think about who God is and what he is saying. You need quiet, apart from the distractions of notifications on your phone or computer. You need quiet apart from the hustle and bustle of the day and to give your full energy and attention to God. PREACHING – Finally, meditation means preaching. It’s not a verbal preaching of God’s Word to other people, but a quiet preaching of God’s Word to your own soul. No one speaks to you as much as you do. Meditation is your time to preach God’s Word, both law and gospel to your soul. Meditation takes time, quiet, and preaching. It is taking God’s Word to heart and applying it to our soul, our heart, our life. Enjoy these moments with God’s Word as you squeeze out every drop out of Jesus. To join us in the plan, follow us here. Here in Wisconsin in early January the sun doesn’t rise until 7:23am. It’s tough to “rise and shine!” and get out of a nice, warm bed for work and school when it’s still dark out, isn’t? Well, Isaiah has those same words for you: Rise and shine! But he’s not talking about getting out of bed in the morning and facing the day. He’s talking about something much more important, something that actually will make you look at your life differently. He says to you: “Arise, shine, for your light has come.” So what’s so special about this light that you should want to rise and shine? This light that Isaiah says should cause us to rise and shine is special, it is welcomed, it is something to long for, because not of what it is, but who it is. It’s what made some wealthy men leave their home and follow a star for many months and hundreds of miles. Men who were looking for the one born the King of the Jews and who maybe knew of some of the prophecies about him made in the Old Testament Scriptures, maybe the very words from Isaiah before us. Men who were perhaps disheartened, because they realized that contentment wasn’t found in their wealth. They found contentment was found in giving it away. Joy wasn’t found in the comforts of this life. They found that joy was gaining that which their hearts were longing for. They came to find peace isn’t found in having everything just right in life, but in knowing that we are alright with God. And all this because of a newborn King that brought light into the darkness of their lives. And into yours too. And so, rise and shine, dear Christian! Light has entered into our darkness, the Light who is Christ, the One God had promised to send all the way back when darkness first entered into God’s perfect creation with sin. The Light that has pierced the darkness of your guilt and shame. He is called Immanuel, God among us, who lived the sinless life we cannot. Light that has come into this world and his name is Jesus, which means Savior, your Savior. He allowed himself to be overtaken by the darkness, to suffer the pain and sadness of the outer darkness of hell, to taste the darkness of death and the tomb, all so that it could no longer claim you or make you afraid. All so that you can have the light of life right now as you live surrounded by darkness. All so that you can hold on to the hope that one day you will get to live in his eternal light. Arise and shine, for your light has come and where you find just what you seek – the antidote to all the disheartenment of this life. To find what the Magi were seeking too – contentment, not found in hoarding wealth, but in sharing it with others because my contentment is in Christ. Joy that isn’t found in the comforts in this life, that’s found in Jesus and the comfort only he can give. Peace, not found in having everything just right in my life, but knowing through my Savior I am alright with God. To find purpose for our lives, yes, even for the mundane tasks of a Monday, all has new meaning, all gives me reason to rise and shine, because it’s all done to the glory of the Lord that shines on us. All because of this newborn King that we continue to worship, continue to offer ourselves, continue to seek! Jesus what a wonderful child! At Mount Lebanon 200 scholars raised their voices to proclaim the good news of the Savior King just two days ago. 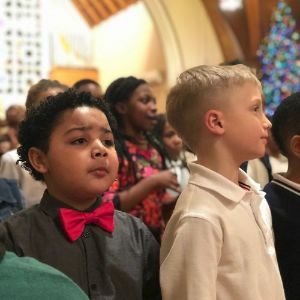 If you were able to attend this standing-room only event, you know the bold and confident heralding of the Christmas message was breathtaking. Click the link below to see the service and our scholars in action! In the Christmas service, we see young people who are confident their inheritance is heaven - they are heirs! They live for him as disciples, distinctively different from the world, and are focused on Jesus, the wonderful Child and Savior. Finally, they provide the greatest gift a Christian can offer- a bold proclamation of the Gospel for the community to hear! 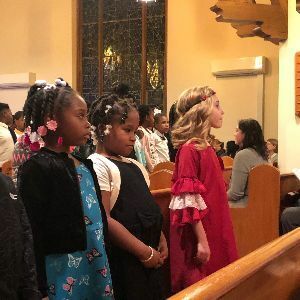 There are many moments throughout the year that so clearly express the mission of Mount Lebanon Ministries and the children's Christmas service is definitely one! Mount Lebanon school seeks, through the power of the Gospel, to make Disciples of Christ who know they are Heirs of Eternity and are determined to be Servant Leaders for the Community. This is our mission: Disciples. Heirs. Leaders. You are invited to join Mount Lebanon in its mission. The Siebert Foundation has offered a dollar for dollar match, up to $25,000, for Mount Lebanon to build a robust science program focusing on Science, Technology, Engineering, and Mathematics (STEM). This grant will allow our disciples to refine their gifts in preparation of a life of service for their Savior. Prepare scholars for careers in physics, computer programming, medicine, and more. Equip scholars with resources like iPads, design computers, and robotics kits. Empower scholars with 21st century skills that prepare them for 21st century careers! If you would like to prepare, empower, and equip Mount Lebanon scholars and help reach this year-end goal of $50,000, you can give online here or by scanning the QR code at the bottom of this letter. On behalf of our disciples, heirs, and servant leaders, thank you, as always, for your steadfast love and support of Mount Lebanon Lutheran School. P.S. I would like to personally invite you to take a tour of school so that you can meet some of our scholars and see the Disciples, Heirs, Leaders mission in action! Please contact me at (414) 464-5410 and we can set up a time for you to visit. To go online here to give. Please note “school donation” in the memo. Thanks! On Wednesday, December 19, our first through eighth grade scholars had the joy and privilege of sharing God’s Word in their Christmas service. Enjoy! Thanksgiving Yesterday, Today, and Forever. Psalm 40:5 – Many, LORD my God, are the wonders you have done, the things you planned for us. None can compare with you; were I to speak and tell of your deeds, they would be too many to declare. This verse invites tenderly invites to ask some simple questions and personally answer them as we spend our quiet time with God. I’ll pose some questions and encourage you to quietly ponder the answers as you look at the way God has been at work in your life. Let it be a time of quiet and joyful thanksgiving for you. How has God been at work in your life? As you look at your past what has God done? It might be something astounding. It might be pretty boring. Think spiritual – how has God been working in your life of faith, bringing you to faith and keeping you in faith? Think physically – how has God been working in your earthly life, taking care of you, protecting you, sustaining you? Take some time. Don’t hurry through this. Take the length of the song to thank and pray. How IS God at work in your life? As you look at your life currently, as it presently is, how is God working? Again, think spiritual – what has God done for you in your faith? How has God grown you in your faith either by teaching or by experience? What have you experienced in life that has instructed you about faith things? Again, think physical – how is God taking care of you and giving you this day your daily bread? Don’t hurry. Pause. Make a list. Rejoice in God’s goodness to you. Take the length of the song to meditate and ponder. The God who has been with you in the past, who is with you in the present moment, will be with you in the future as he gives it to us. He will guide the future as he has the past. He still controls the waves just like he did while he lived below. He is your God and your Savior. Just imagine what he can do. Imagine what he will do. Since he has done all that he has done and is doing, he will certainly do even more. God isn’t finished with you or with me yet. He still has more in store for us. And he can and will do even more than we can begin to imagine (cf. Ephesians 3:20-21). Lord God, I thank you for all that you have done and are doing in my life. Were I to list all the things you have done for me there would not be enough books. God, I praise you for all your wonderful deeds. I thank you for still working in me and in my life today. I can’t wait to see what you’ll do and how you’ll work. I’m sure my dreams of tomorrow will pale in comparison to the wonderful things you’ll do for me. Amen. Psalm 145:13 - Your kingdom is an everlasting kingdom; your rule is for all generations. The LORD is faithful in all his words and gracious in all his actions. Did your guy get elected last night? What about your gal? Did the person you voted for and the person you prayed about get their seat? Did someone else get their seat instead? Did someone get elected for whom you did not vote? It doesn't matter. Jesus is still king. It's naive to think that the "right" or the "wrong" elected official has more power and more authority than our Jesus who has ascended and now sits at God's right hand. Jesus rules the nations, even our elections. And he does it all for our good. That's true no matter who is elected. Jesus is going to rule our city, our state, our nation and even our world for his good. His kingdom and his rule is an everlasting kingdom and it extends through all generations. And now we pray that our King would pour out his Spirit on those elected to give them wisdom. Now we pray that God would bless their rule in whatever way he sees fit so that we may live in peace and security; most importantly, that we might continue to preach the gospel (cf. 2 Timothy 2:1-2). PRAYER: Lord God, you rule all things. You put officials in their seats and fill their offices with the men and women you want there. We have voted and you have worked through us to elect officials in our city, state, and nation. We thank you that you have put them in their positions. We thank you for them; they are a gift to us from you. Lord God, we pray that you would bless these newly elected leaders with wisdom. Bless their rule and leadership that we might be blessed by them. Grant us peace and security through them so that we might continue to preach the gospel. It’s easy to be thankful this time of year, isn’t it? With Thanksgiving just around the corner, we, along with our entire nation, will give thanks for the many blessings we have. At Christmas we will take time to give thanks to God for his gift of a Savior. All of the holidays coming in the next couple of months will bring gifts and time with family and friends, which we will also be very thankful for. It’s easy to be thankful at times like these. 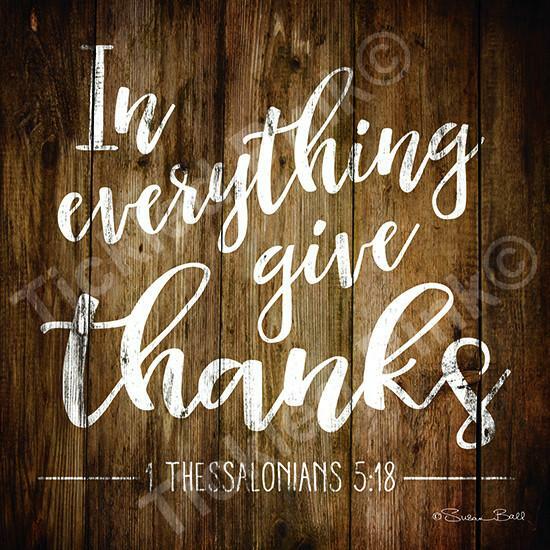 But did you catch what the verse above from Thessalonians says about giving thanks? “Give thanks in all circumstances.” That not only sounds tough to do, it sounds impossible, doesn’t it? How can we give thanks in all circumstances? When my loved one is on their death bed, give thanks? When I am stuck in a wheelchair, give thanks? When I have to go to a job every day that I don’t really like, give thanks? When my neighborhood is dangerous to live in, give thanks? When I am on the brink of financial disaster, give thanks? The answer is, “Yes!” Yes, in all circumstances, give thanks. Everything that happens in this life, even the bad stuff, happens to you to bring you closer to your God. God uses everything in this life to refine and purify your faith. He uses everything in this life to focus your thoughts and worries away from your problems and your own solutions and to look to him for strength and answers. He uses everything in this life to lead you to the cross to see his love for you on full display, that cross of Jesus where we receive true comfort true peace, and true joy. It’s easy to give thanks when things are going well for you. It’s much harder to do in times of difficulty. But don’t forget the love that God has for you personally. Don’t forget what God has done for you in Christ. Don’t forget what he has promised you now, and eternally. You have reason to give thanks in every circumstance of life, because your God has taken care of your eternal need, and everything in this life happens in order to get you there. Give thanks. Not just in this coming holiday season, but in all circumstances. This is God’s will for you in Christ Jesus. Those of you have been blessed to raise teenagers, did you ever have them come to you and say, “Thank you for grounding me for the week and not letting me use the car or hang out with my friends and make me be in by 7pm on weekends. I really appreciate it Mom and Dad, it really helped me to learn something about life and about myself.” No? Never happened? Discipline is often not very well accepted by our children, is it? The word “discipline” often has a negative connotation, doesn’t it? It’s often equated with punishment that can be cold and harsh. But the biblical meaning of discipline really is to provide guidance for responsible living, to offer correction and training for good. You can see the word “disciple” in the word discipline, can’t you? There is an obvious correlation between these two words. Christian parents discipline in order to make disciples of Christ, who walk in his ways, who want to obey him and honor him in their life. And God disciplines us too for the same reasons. This Thanksgiving you have many things to be thankful for. But what about discipline? Are you thankful for the trouble, the suffering, the pain that you have to endure in this life? We all have them, don’t we? What is it for you? Maybe a struggle with depression. Parenting a child with emotional, physical or mental challenges. Chronic illness. Continual financial struggles. The loss of a spouse or parent or child. You can probably identify a number of struggles, hardships, and pain that God allows in your life that are meant to humble you and test you. And no one really enjoys the discipline, right? We live in a world that is all about quick fixes: losing 30 pounds in 30 days, quick relief from pain with a pill, muscles of steel by exercising five minutes a day. We like quick and easy. But often that’s not the way God works. Very often we don’t see the results of these trials in our life until a long time afterwards, and maybe never this side of heaven. And these experiences, that at least while we are enduring them, are experiences that we’re not necessarily always grateful and appreciative of, are we? But the truth is, in his grace and wisdom, God disciplines us for our good, because he loves us. Through that discipline he trains us and through it brings us closer to him and leads us to rely on him rather than on ourselves. He disciplines us because he wants us to let go of everything else an look to him and know through it he desires to produce a harvest of righteousness. This Thanksgiving holiday, I pray that you are truly thankful for everything – even for all the difficulties and struggles he allows in your life. Thank and praise your God who uses everything in this life to bring you closer to him and to keep you focused on your heavenly home. “What is my purpose in life?” is a question that gets replayed over and again at every stage of life. College students rack their brains trying to determine their purpose in life as all sorts of philosophies are spread out before them like food at a restaurant buffet. Empty nesters restart the quest when their children have moved out. As their health and abilities decline, the elderly often wonder what purpose they still have. Have you found your purpose in life? It is a question that is always demanding an answer. It is always there haunting us, confusing us, bewildering us. For many it is a painful question because the answer has eluded them. The reason why so many of us struggle to find purpose in our lives is because we keep looking to the wrong person for the solution. While it seems to make sense to look inwardly for our answer, we won’t find anything more than a mirage, a grasping at the wind. Jesus helps us look beyond ourselves to find our purpose. You see, our purpose in life is a combination of “out of this world living” and “living our lives for others.” Jesus states our purpose for us in a book of the Bible called Matthew. In Matthew 22:37 and following, Jesus unveils that purpose. He removes the smoke and mirrors. He states our purpose with crystal clarity. He says, “Love the Lord your God with all your heart and with all your soul and with all your mind.” He then goes on to say, “Love your neighbor as yourself.” With these words Jesus directs us to live for God and for others! Do you want contentment in your life? Then discover or rediscover God by getting to know him and love him personally through the good news of the Bible. Be strengthened through his means of grace, found only in his word of life (the Bible) and his sacraments of Baptism and Communion. Safeguard your soul as it yearns for the one who loves you more than you can imagine (Jesus). Use your mind to seek out ways to serve God and to serve others. Living with God’s purpose as your reason for living is living a life of amazing adventure! Psalm 46:7 – The LORD of hosts is with us; the God of Jacob is our fortress. We were watching a movie with our kids the other day. It was a movie where the girl left the guy with the kid. The marriage had fallen apart and they were totally broke. So she left. Our kids looked at Ruth and I and said, “You won’t do that!” They were absolutely confident of that. But there is perhaps a part of them that sees their friends in single parent homes and wonders, “Will this happen to me too? Will mom or dad have to move out? Will mom and dad get a divorce?” They’re afraid that they’ll get abandoned. Think back to those moments as a kid when you were most afraid. Perhaps you had been wandering in Sears and suddenly you looked up and around and couldn’t see mom or dad. “Did they leave? I’m all alone.” In the past our older kids would walk to the corner and we would pick them up there. Every once in a while I would be a few minutes late and I would get a frantic phone call, “Dad, are you coming!? !” Deep down we all have this fear of being left alone, of being abandoned. And it doesn’t change as we age. I’ve spent enough time visiting people in the hospital, in the nursing home, in jails, in their homes to know that people hate being alone. You can tell in the conversation. They’re just glad to have someone to talk to. They’re just glad to know someone is there. They’re just glad to have someone in their room who cares about them and wants to spend time with them. For the next hour or two, or as long as you can give them, they are glad for your presence and your company. But you don’t have to be in a hospital or nursing home to feel all alone. When we go through a hardship or trouble in our lives we often feel like we’re going through it all alone. It feels like there is no one who understands, like there is no one who cares. Sometimes there are even people right there with you, but you feel as if you’re going through this all by yourself. When trouble comes – no matter what that trouble is – we can feel at that time more than any other that we are all by ourselves. We just hate to be alone. Lord God, I thank you that you are with me. I sometimes feel very much alone, isolated and abandoned even though there are people all around me. But God, you promise that you are always right there by my side. You promise that even if everyone else leaves, you will not forsake me. You promise that even if I am abandoned by all people, you will never abandon me in the dark and difficult moments of my life. And even if it seems like you have left me, your Word assures me that you haven’t and you won’t abandon me. Help me to stand on this, your word of promise. You will not leave me now or ever. Amen. On August 26, 2018 Missionary John Roebke will be at Mt. Lebanon Lutheran to share his experiences of serving as the Director of Communications for One Africa Team. Missionary Roebke and his wife Nancy have been living in Malawi since June 2017 and currently reside in the city of Blantyre. Missionary Roebke works closely with the Publications committee of the Lutheran Church of Central Africa – Malawi Synod to produce and distribute books and tracts. In addition, he is responsible for coordinating publications efforts across Africa with the WELS Multi-Language Publications Committee (MLP). This past summer, MLP underwrote a Translators Workshop that was held in Lusaka, Zambia. 24 participants from 8 countries spent two weeks gleaning valuable insights from Dr. Ernst R. Wendland into the art of communicating across cultural and linguistic barriers. Both John and Nancy Roebke are graduates of Fox Valley Lutheran HS (’86). The Roebkes served as WELS missionaries in Eastern Europe from 1994-2003. They have also served congregations in Wisconsin and Alabama, and have two daughters who live in the United States. A look back at our lives, at the path that they’ve taken, at the events that have happened, helps us to see God’s plan. He’s been at work to bring us to this place and this time. As I’ve had the opportunity to visit with many of the members of the Mount, I generally ask this question: What brought you to the Mount? The answers are different, but also the same. Some people will say it was a boy or a girl, a husband or a wife that brought me. Others will say that their parents brought them. Some will say that the school was a draw. Others will say that circumstances in life drove them to their knees and the Mount was right here, right at the corner of 60th and Hampton, right in the neighborhood where they lived. All of the answers are different, but, a look back, also reveals that they are the same. It was God who put those people in your life to connect you to Jesus and to the Mount. It was God who put you in this community and sent those events into your life. It was God who drew you to himself through people. It was God who called you to be his own through the Gospel. That’s what Paul wanted the people of Athens to know. They were unbelieving pagans who were seeking a god; they just didn’t know who the true God was yet (but Paul was about to tell them!). Paul wanted them to know that the true God had arranged everything in their lives, the times of their lives and the places where they would live SO THAT they would seek him and find him. That is precisely what God has done for you in your life. He has put you in the right place at the right time so that you’d hear this message about Jesus, so that you’d receive the adoption to sonship, so that you’d hear his call and believe. He put people in your life so that they could tell you. He put events in your life to draw you to himself. He put you in the right place at the right time to save you. Now think. God has done the same thing for every other person in this world. Paul was talking to the unbelievers around him and saying, “God put you in the right place and the right time so that you’d seek him and find him though he isn’t far away at all.” That’s also true for the people who live around The Mount in our Hampton Heights community. That’s true for the people who live around you in your communities. That’s even true for the people you interact with at stores. It happened to me just the other day. I had to get my phone replaced and the woman helping me noticed my e-mail (pastor.bourman@gmail.com) and asked, “Where are you a pastor?” And the conversation went from there. God put me at the right place and the right time in her life and her husband’s life SO THAT they’d seek out and find him (and it took a broken phone to get me there). God has put The Mount the right place and the right time. He has planted our church in the Hampton Heights community to serve the people here, to share the gospel with the people here with the gospel. He has planted our school here in this community so that we might transform families and raise up disciples, heirs and leaders right here at this time and in this place. He has put us here at the right time and in the right place for them and their salvation. We are The Mount and that’s why we’re here: to transform this community and the families of it with the gospel of Jesus. And God has put you at the right time and in the right place. He has put you in your neighborhood with your specifics neighbors at this time in history to impact them with the love of Jesus and his Gospel. He will give you daily interactions which are not accidental, but are arranged by him so that you can share the Gospel with those whom you meet. God is always at work and he will use us at just the right time in just the right place. How will he use you today? Jesus told this parable: “The ground of a certain rich man produced a good crop . . . he said, ' . . . I will tear down my barns and build bigger ones, and there I will store all my grain and my goods. And I'll say to myself, “You have plenty of good things laid up for many years. Take life easy; eat, drink and be merry.” But God said to him, 'You fool! This very night your life will be demanded from you. Then who will get what you have prepared for yourself?’ This is how it will be with anyone who stores up things for himself but is not rich toward God.” (Luke 12:16-21).